BANFF, ALBERTA, Canada – If you’re looking for the best rock climbing programs in the Canadian Rockies, Yamnuska Mountain Adventures offers world class training for beginner to advanced climbers. Our certified guides are leading edge climbers and have lots of experience working with individuals, families and groups. We maintain a solid reputation as one of the leading mountain schools and mountain guide services in North America. Our experienced guides, who also own and operate the school, will leave you with an unforgettable mountain experience. We also take safety very seriously and go to great lengths to protect our students from injury while learning rock climbing techniques. Don’t miss the opportunity to enjoy rock climbing in Banff , one of the best adventures in the Rockies. In addition to rock climbing in Banff National Park, we provide an awesome ice climbing experience. Our professional guides have years of experience ice climbing in Banff and can teach you the essential techniques and safety protocol. At our Banff ice climbing school, you’ll learn how to use a transceiver, check avalanche conditions and reduce your risks with our industry-leading safety systems. Our Banff ice climbing guides use the Yam Ice Exchange network to share the latest weather and avalanche conditions. For those looking for adventure, mountaineering in the Rockies offers the thrill of a lifetime. Through our private lessons and scheduled programs you’ll discover a true Canadian Rockies experience. Our intermediate and advanced itineraries are unmatched. Whether you’re a beginner or an expert, Yamnuska offers top notch mountaineering, backcountry skiing, rock climbing, ice climbing and trekking experiences in the Canadian Rockies. We rank as one of Canada’s best mountain school and mountain guide companies year after year. Watch this Yamnuska Mountain Adventures video and experience the majestic Canadian Rockies today! 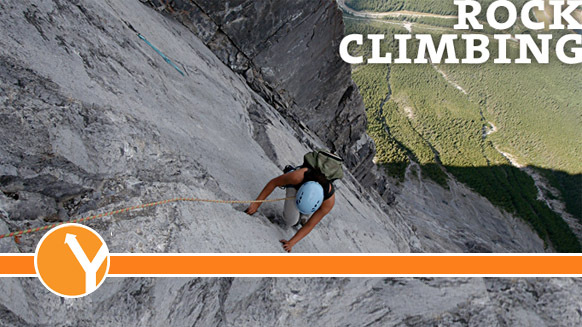 Our Canadian Rockies rock climbing tours challenge each individual’s mental and physical stamina. Rock climbing in the inspiring Banff National Park in Alberta provides an outstanding learning experience. Always follow the recommendations of your experienced Banff rock climbing guides and consider safety first.